The drilling industry’s efforts to open New York state to shale gas development, stymied from the get go, is meeting even more resistance over time. Contrary to public statements earlier this year by New York state governor Andrew Cuomo that suggested permitting for shale gas wells is imminent, there are compelling reasons to believe that it will continue to be on hold for the foreseeable future. Most visible among these is an anti-fracking movement that is growing louder and more organized each year. New York, which sits over one of the richest sections of the Marcellus Shale, has become a national showcase for activists trying to stop an on-shore drilling boom targeting shale gas formations in the northeast. A current example involves a coordinated effort by a group of high profile artists and performers from the Empire State organizing a rally and concert in Albany on May 15. 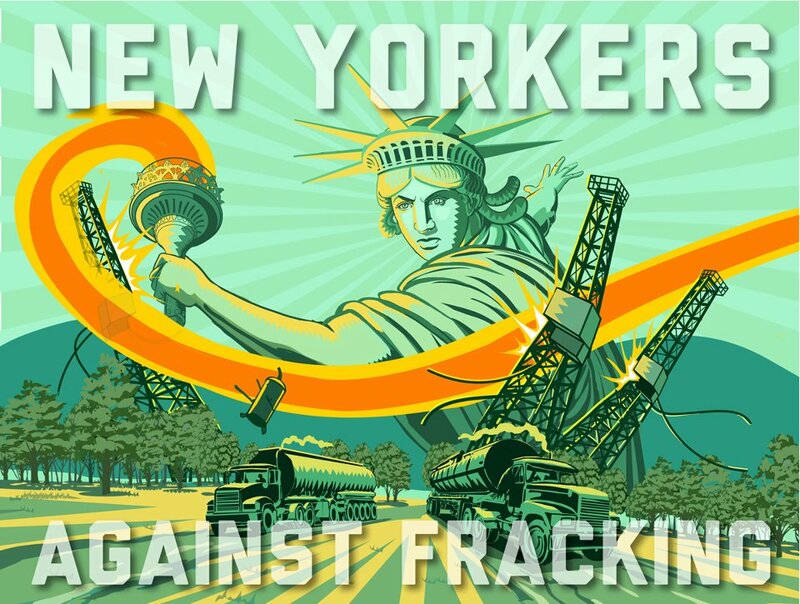 The event – New Yorkers Against Fracking – features Natalie Merchant, Joan Osborne, Mark Ruffalo, Melissa Leo, and others sure to have inspirational appeal to large, mainstream audiences. Merchant, a fracking critic who performed in Binghamton in March, is a primary organizer of the event. She and a coalition of artists who live throughout the state are collaborating “to raise awareness about the potential environmental and health impacts of fracking,” she said. “We are working to create a concert that will inform as well as inspire.” The group has recruited acts from a mix of genres, ranging from Dan Zane, a popular children’s folk artist, to the jazz trio Medeski, Martin and Wood. The rally will also feature speeches and performances by authors, actors, scholars and politicians. Activists cite unacceptable risks to health and ecology from high volume hydraulic fracturing, used to stimulate gas well production, which is exempt from the federal Safe Drinking Water Act and hazardous waste regulations. The process, known as fracking, injects large volumes of fresh water mixed with chemicals into well bores to fracture bedrock and release gas. Permitting for shale gas development in New York has been on hold since the Marcellus Shale boom began in 2008 as the state revises its policy to account for the environmental impacts of hydraulic fracturing through a document called the Supplemental Generic Environmental Impact Statement (SGEIS). Finalizing that document has been an uncertain and contentious process, and the activists have essentially used the state’s public review of the issue as a vehicle to highlight the extent of fracking opposition. Politicians are a sound gauge of public sentiment, especially during an election year. A true test of the anti-fracking movement will be pending legislation in Albany that could derail any attempt by the DEC to begin permitting shale wells anytime soon. Bills in both houses would extend a moratorium to allow the state Department of Health to conduct its own extensive review of the impact of fracking. The bills are supported, among others, by downstate politicians answering to votes of people who get their water from the Delaware River watershed – which happens to extend over a lucrative pay zone of the Marcellus Shale. The Assembly bill was introduced by Robert Sweeney, of Suffolk County, who is chair of the Assembly’s Environmental Conservation Committee. Supporters in the Senate include Republican Greg Ball, whose district includes parts of Dutchess, Putnam, and Westchester counties, and Toney Avella, a Democrat from Queens. Shale gas supporters in Albany, meanwhile, have been keeping a relatively low public profile on the issue since prospecting has eased in their districts with the falling price of natural gas. Senator Tom Libous, who represents farmers living over a prospective drilling fairway in Broome County, was once an outspoken champion for the drill-here-drill-now contingent during Gov. David Paterson’s administration. Perhaps owing to the low natural gas prices (coupled with the give-and-take of doing business in Albany under Cuomo) Libous now defers to the DEC’s judgment to determine “if and when” drilling should start. Perhaps the biggest influence of all on the future of shale gas development, however, is the low price of natural gas caused by a market glut. Natural gas prices move in cycles. If and when demand again pushes prices up, you can bet you will see renewed political urgency from those representing the industry and people with landholdings who can gain financially from lease agreements. Big money has a way of motivating both politicians and the people who vote for them. When this happens, anti-fracking activists would be well advised to have a feasible plan to push for an energy policy that can economically displace the demand for fossil fuel.